Gaeke Construction has experience in a wide variety of commercial construction projects. 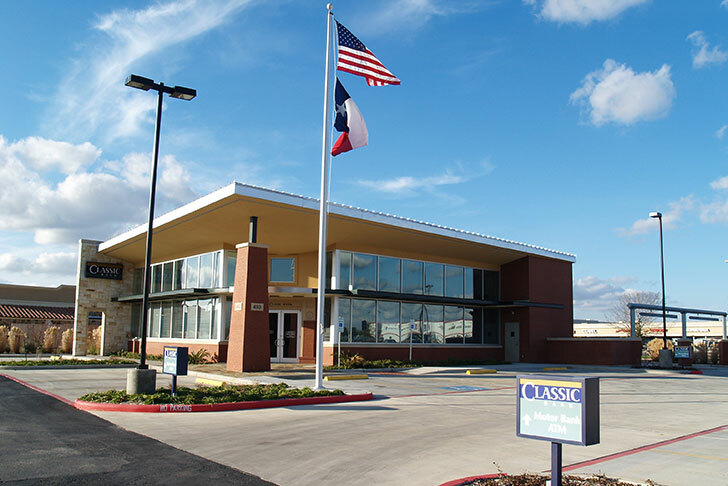 The Classic Bank Bastrop location is the third branch banking facility that Gaeke Construction has completed for the Classic Bank Organization. The bank is of a contemporary design, a structural steel frame with a combination of brick, stone and glass exterior. A notable architectural feature is the unique clear story design that allows for ample outside light to enter the building from the east and south elevations. Also the interior finishes are complimentary to the contemporary theme. The interior oak wood work wood and cabinetry are exquisite. Gaeke Construction Company has had a long standing work relationship with Cutright & Allen. The Classic Bank, Bastrop, is just one of eight banks completed with the Cutright & Allen firm in the past twelve years. The contemporary plaster and brick exterior features tapered columns that support a series of metal sunscreens shading the front facade deck. Constructed of structural steel and a wood truss roof system, the standing seam architectural roof features a unique concealed gutter system.The modern interior is customer friendly with plenty of natural light. BUILDING SIZE: 7,500 SQ. FT. COPYRIGHT © 2018 GAEKE CONSTRUCTION CO. All rights reserved.